The USA, that since the begin of the nineteen century was following an aggressive expansionist policy in Latin America, brought the USS Maine into the port of Havana without asking for permission to the Spanish Colonial Authorities, which contravenes the diplomatic rules. The Spanish weren't intimidated and in response send their cruiser Vizcaya to New York. On February 15, 1898, the Americans provoked themselves an explosion in the Maine. Which killed 355 US servicemen and ultimately sank the ship. From this moment on there was no way back any more. The US declared war on Spain. The north-american forces were clearly superior to the Spanish ones. But the Spanish could do little more than try to defend themselves to contain the damage to their already reduced empire. Not surprisingly Spain lost Cuba. 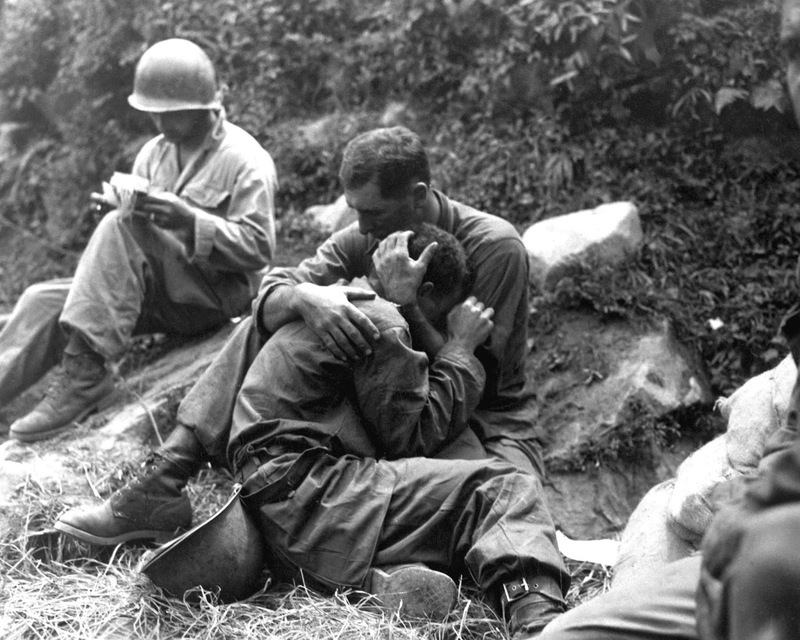 But on the same war they also lost the Philippines and Guam, which were the most valuable parts of their empire. On the way, the US also annexed an unrelated country, Hawaii, which shows that the all war was nothing more than an imperialist enterprise. The Spanish-American war was the first case of a war triggered by a false-flag event, which would repeat itself repeatedly during the 20th and 21st centuries. 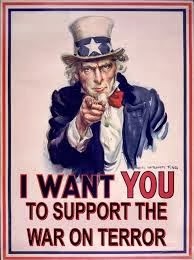 The US was supposedly neutral at the begin of the war, but he indirectly supported the allies by sending them supplies. They started supplying weapons to the British in passenger ships to use civilians as human shields. Instead of recommending US citizens not to travel in those ships the US State Department remained silent. But the German Imperial Government published notices in the British and American press where they warned people that if they traveled in such ships it would be at their own risk, because they considered them as legitimate war targets, since they were transporting weapons. 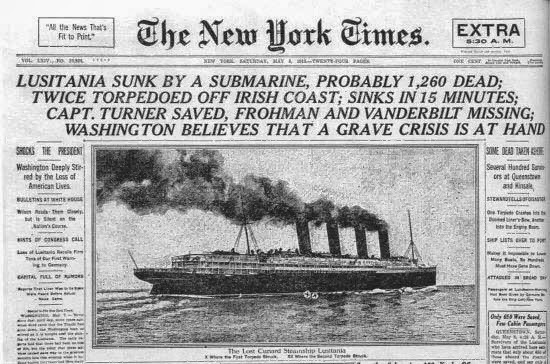 Indeed, the Lusitania was torpedoed and sunk on May 7th, 1915. 128 Americans died. The US government refused to compensate the families of the victims, but the Germans in an amazing act of chivalry did offer compensations to the victims. This and other naval incidents which could have been avoided were used (among other reasons) by the US government to enter the war in 1917. In the begin of the 1940's many people still remembered the pointless and unjustified entry of the US in the First World War, especially the families of the soldiers that died there, most of them draftees. That's why there should be very good reasons if the US were going to enter another war. Japan had been carrying out an expansionist policy in Asia during the decade of the 30's. But so was doing the USA also. A confrontation between both countries seemed unavoidable. President Franklin Delano Roosevelt wanted nothing better than to enter the war. 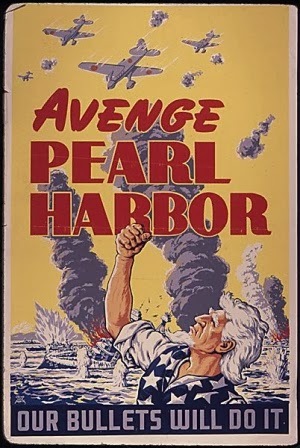 They could have easily avoided the Japanese attack on Pearl Harbor. The Japanese codes were already cracked and FDR and other high officials of his administration had advanced knowledge of the attack. It's more, they anchored their outdated and broken ships at Pearl Harbor so that their good ships could be used in the coming war. The Japanese were stupid enough to fall in the trap. After the attack there was no way back any more. FDR and his Illuminati masters had the pretext they wanted to enter the war. After the end of the Second World War, and the defeat of Japan and Germany, the Illuminati needed another external enemy to distract the attention of the people from internal problems. 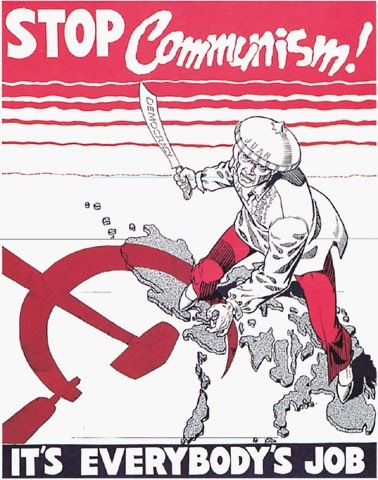 The communist Soviet Union was an obvious choice. After the war the USSR was totally destroyed, it had lost 26 million citizens and its economy was exhausted. Stalin didn't have any intention to attack the USA. Even if he would have wanted to do it, he wasn't in condition to do it. Actually, he ordered the demobilization of most of the soldiers that were coming back from the war to put them into civilian jobs to start stimulating the economy. Nevertheless, the US government started manipulating the media to present Russia as threat that was not. After all the atrocities of the war, the public was just ready to believe anything. Understandably, the USSR felt really threatened, and so started an arms race and a cold war that almost destroyed the world. In 1950 the Americans and the South Koreans started making military exercises and staged preparations for an invasion of the North in front of the eyes of the North Koreans. They believed they really were going to be attacked. Since there is no better defense than a good attack, Kim Il Sung asked permission to Stalin to invade the South. The Soviet leader approved Kim's plans. So started a three years long war that served its purpose: to keep the Military Industrial Complex going. 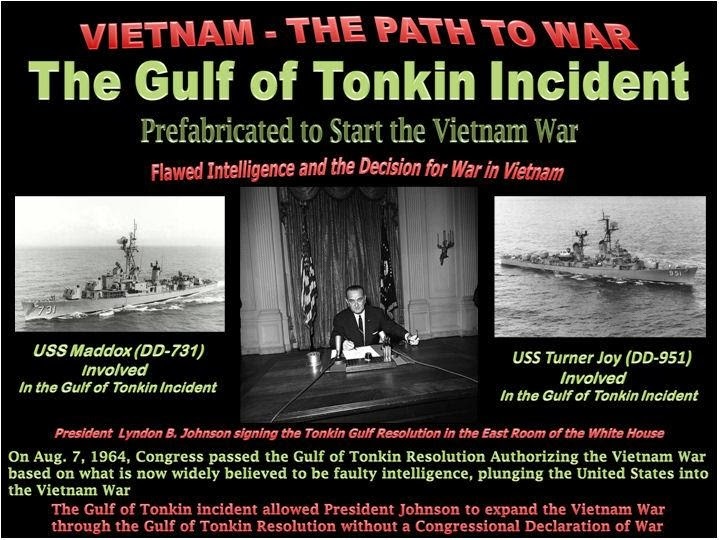 On August 2nd, 1964, after already 14 years of involvement in the Vietnam War, the US government staged an naval incident in the Gulf of Tonkin so that they could escalate the war. Supposedly, USS Maddox fired upon North-Vietnamese ships after being harassed by them. Two days later a similar "incident" involved USS Turner Joy. 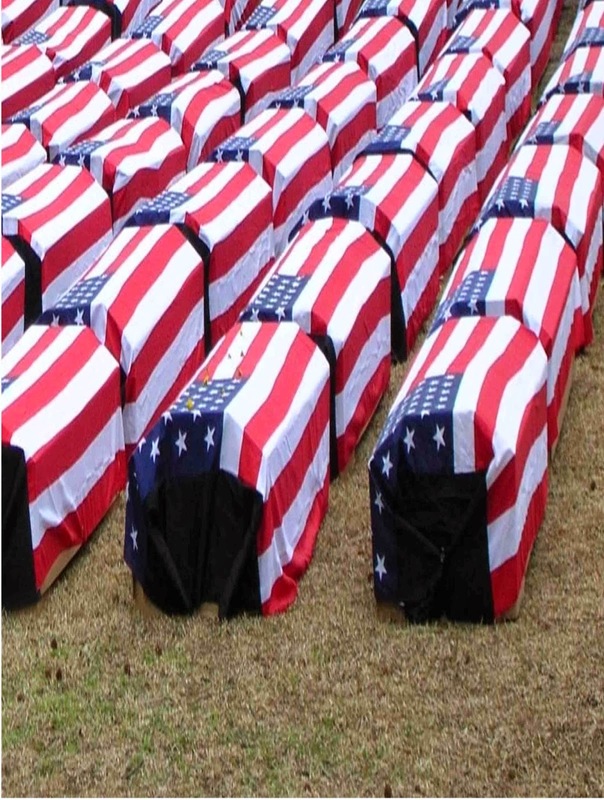 The war killed 37.000 US servicemen and destroyed their families. I don't need to tell you that 9/11 was an inside job. It's just evident. Just Google 9/11 inside job and you'll get millions of sites explaining it to you. Probably Al-Qaeda did not even exist. In 2003, the Bush mobster regime sold the movie that Saddam Hussein had weapons of mass destruction. The public, that by now was already so hypnotized by the garbage on TV and the poison in their food that they did not even care if it was true or not. Although the war ended officially in 2011, thousands of soldiers remain in Kuwait, Saudi Arabia and Afghanistan to threaten Iran. They also had a minor war in Libya in 2011 and they are fighting a proxy war in Syria through the Sunni rebels their. Actually, since the war in Iraq the US go around overthrowing any regime they don't like, with or without UN approval. They don't care about that. They don't care about anybody. The Illuminati mafia that controls the US government cares only about themselves.